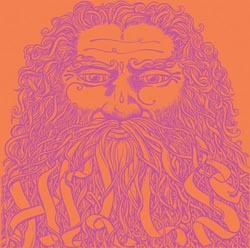 Hills are a new instrumental Swedish psychedelic rock band. The CD has some really cool hand drawn artwork but provides little information about the band. It appears that one track on this CD has appeared previously on a cassette release and there is a totally unreleased track. These were not on the sold out vinyl release. Death 1 starts things off and is a strange little track with some flute and a dark vibe with lots of strange sounds. Istikal Street is a bit of a krautrock like track to start and like all this bands tracks it mutates into something totally different over the 8 minutes. One of the stranger tracks to start and later beautiful. Rainship is a strange track with a noodling guitar, hand clapping and running water for three minutes and then drums and bass kick in while the rain stops and the guitar player, he just keeps on flying with a killer solo. They really freak out later. Super cool track. Ex Oblivione is a strange 4 minute track with a weird sample that is very distant and you can't really understand it at all as the band play drums, bass and a spacey guitar with delays and stuff over the top. It is pretty dreamy at the end. Schlaraffenland is one of the unreleased tracks and over 12 minutes long. It is a high energy and very grooving track. Messias the last track and also unreleased (not on the original vinyl release) and is a 4 minute more spacey track with keyboards and spaced out guitar and very droney. A very cool psychedelic rock CD.